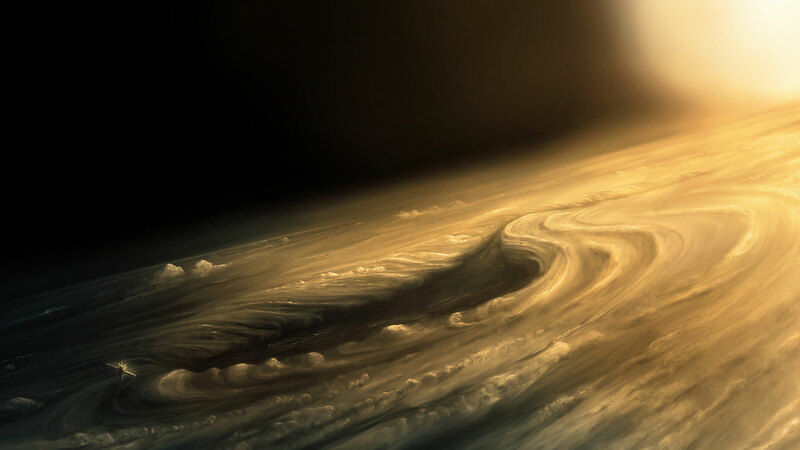 Jupiter’s high-pressured gasses and high temperatures have made it challenging to explore. If all research goes well, NASA’s Windbots will brave Jupiter’s storms, which means a heavy mission might be underway for the drones. Jupiter is the largest planet in our solar system and has been quite a difficulty to explore due to its unique traits that deem it beyond challenging. The planet’s size and mostly gas composition (that we know of) might be hiding a harder core somewhere in the middle, but so far that will remain just a theory. Attempts have been made to explore inside the high pressured gases of Jupiter. In 1995, the Galileo spacecraft sent a titanium probe that weighted around 340 kilogram (around 750 pounds) to delve through the planet’s atmosphere. The pressure of 23 times more than it is on Earth crushed the drone in a mere 57.6 minutes of its attempt at further exploration. And if the pressure is not enough to eliminate anything attempting to prod at Jupiter’s atmosphere, the known temperatures of at least 153 Celsius (307 Fahrenheit) were enough to melt even the high density Galileo drone. It made further exploration impossible. Researcher Adrian Stoica at Jet Propulsion Laboratory (JPL) has recently been given the funds to develop “windbots”, meant to float out to the outer layers of the largest planet within our solar system and basically ride the strong winds of Jupiter’s atmosphere. The windbots will be packaged in a lightweight frame, littered with sensors that may help NASA better understand the magnitude of Jupiter’s storms. The concept design and functionality was based on the example of a dandelion seed, which is able to remain airborne during long periods of time within nothing but the wind to support it. Its rotation during fall leads to a subsequent lift. The same principle will be applied to the windbots. And since they will not require fuel, they will be powered by winds alone, which the planet provides in full. While not meant for exploration within Jupiter’s highly pressurized depths, a swarm of the dandelion-inspired drones will be sent through the fast winds and vicious storms on the outer layers. It will help learn more about the planet’s atmosphere and, perhaps, in turn, about our own. The design is still in its initial stages and it’s expected to first be tested out within the more windy parts of the United States. Even if its use in outer space might be impossible, it could still prove useful for weather forecasts and sent into hurricanes for detailed data. However, one or two windbots may be brought along with future explorations around Jupiter’s satellites.